Should the Ember ceramic coffee mug be smart? Should This Thing Be Smart? Coffee Mug Edition. The Ember ceramic coffee mug aims to keep your coffee at a perfect temperature. Photo illustration by Slate. Image by Ember. Welcome to Should This Thing Be Smart? Each month, Justin Peters examines a smart object and try to determine whether there is any good reason for its existence—and how likely it is to be used for nefarious reasons. Previously on Should This Thing Be Smart? : The $60 smart fork and the $199 smart socks. Function: The Ember Ceramic Mug is basically a coffee mug that is also a thermostat. It uses sensors, microprocessors, a temperature control algorithm, and 13 secret herbs and spices to keep hot drinks at a chosen temperature between 120 and 145 degrees Fahrenheit for as long as it takes you to drink them. * It is sort of like a Thermos, albeit one that is very high-tech and costs as much as an Amtrak ticket. The mug pairs with an app that lets you adjust and monitor your beverage’s temperature, which is a great feature for those of us who like to pour a cup of coffee and then observe it from afar. If you are that sort of person, then the Ember Ceramic Mug might be the mug for you. The case for the smart coffee mug: The Ember Ceramic Mug is a very interesting mug! It attempts to solve three problems that have plagued mankind for centuries: 1) After a while, hot coffee will become cold; 2) sometimes hot coffee is far too hot; and 3) it almost never happens that the temperature of your coffee is just right. This is known as the “Three Bears Dilemma,” and it reflects our greatest scientists’ utter failure to apply their talents to useful problems. We can put a man on the moon, but we can’t invent a cup that reliably thwarts the laws of thermodynamics? Not my country. Enter the Ember, which does what Einstein, Tesla, and Rosalind Franklin couldn’t—or wouldn’t (furrows brow, mutters darkly). When hot coffee first enters the mug, it cools naturally as heat escapes via the open top. Then, once it reaches your desired temperature, the mug’s heating system kicks in and holds that temperature for as long as its battery remains powered. * (Battery running low? Simply whip out the “charging coaster” that comes with the mug.) Theoretically, this means that your final sip of coffee will be just as satisfying as your first. At the very least, it makes it more likely that you will actually drink that final sip of coffee, rather than pouring it down the drain because it has become room-temperature sludge. This is what we coffee fiends call a “real pick-me-up.” Have you ever stopped to think about the amount of coffee you have made or purchased and then abandoned over the years, either by discarding it because it’s too cold or spitting it out violently because it’s too hot? It probably amounts to gallons—which, given the ever-rising price of drip coffee, probably amounts to hundreds of dollars. What a waste! The Ember prevents waste. The Ember will encourage and enable alimentary experimentation. At long last, you can finally get some answers to age-old questions such as: Does coffee taste better when served at 126 degrees, or at 127 degrees? How about 128 degrees? Or 129? What does coffee taste like when served at precisely 130 degrees? Or 131? Answers will soon be forthcoming. The Ember is a mug for lingerers. Are you the sort of person who takes an hour to drink your coffee, savoring every sip like someone in a Folgers commercial? Do you enjoy lounging in an overstuffed chair with your drink, perhaps while pondering the state of the union? If so, then you will derive great benefit from the Ember. Bring it to a coffee shop and feel smug as you look at all of those Luddites who can’t control the temperature of their beverages. 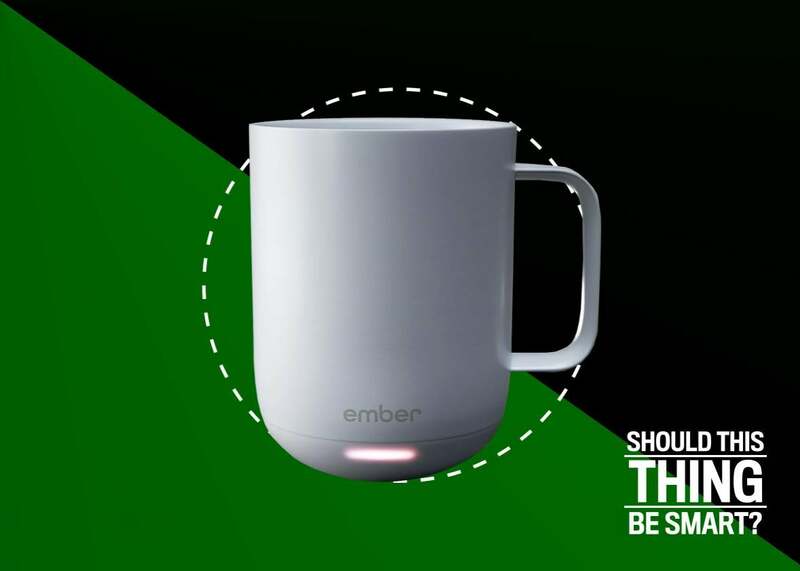 The mug even features an LED near the base that changes colors to indicate the status of the mug and its contents; you can use the Ember app to adjust those colors as a means of making the mug your own. If you are in a bad mood for some reason, you can make the LED turn blood red, perhaps while loudly grumbling “MY MUG’S LED IS BLOOD RED, LIKE MY MOOD.” If a few sips of your precisely heated coffee cheers you up, you can set it to, say, a sunny yellow. “MY MUG’S LED IS SUNNY, LIKE MY MOOD,” you can announce. There is lots of room for changing colors and yelling with the Ember Ceramic Mug. Ember also sells a travel mug, in case you ever have to drink your coffee on the go. The travel mug is more expensive and does not change colors, but it does come with a lid. Who doesn’t love lids? The case against the smart coffee mug: You have to have a smartphone in order to get the most out of your Ember Ceramic Mug, which is a real bummer for everyone out there who still has a flip phone. Without a smartphone, you will not be able to adjust the temperature to your specifications—it will stay locked at 130 degrees Fahrenheit—nor will you be able to adjust the LED light to your liking. This dependency on the paired app is unfortunate, because I think that lots of people drink coffee to get away from their smartphones. The Ember will not let you escape. There is no escape from the tyranny of push alerts. Coffee gets cold for a reason, and that reason is called entropy. Systems cannot retain their energy indefinitely, despite what Silicon Valley might have you believe. The Ember embodies man’s hubristic belief that he can impose order on an innately decaying universe. Embracing this fallacy will lead only to sorrow. The Ember is ostentatious. While coffee is the great leveler—everyone drinks it, rich and poor alike—the Ember creates implicit class divisions. Be wary of bringing it onto a city bus, where your mug’s glowing LED will turn the heads of the rest of us schlubs who are sipping lukewarm coffee out of Styrofoam cups. “MY MUG’S LED IS GREEN BECAUSE I HAVE MORE MONEY THAN YOU,” it might as well be saying. The Ember may very well foment class warfare. Perhaps that’s why the travel mug doesn’t change colors? The ceramic mug only holds 10 ounces, which, honestly, is nowhere near enough coffee for most people in our modern supersized culture. Let me know when the Ember Ceramic Gallon Jug is ready, and then we can talk. The mug is not actually a full-fledged ceramic mug. It is made of stainless steel and only features a ceramic coating. Also, my sources inform me that, its name notwithstanding, the mug’s heating system is not actually powered by tiny charcoal embers. The Ember Ceramic Mug is fake news. Ember recommends that you don’t put the mug in either the dishwasher or the microwave. Well, then, where are you supposed to put it, Ember?? I do not think we should be encouraging coffee-lingerers. These layabouts wreak enough havoc, what with their aimless loquacity and their tendencies to monopolize wall outlets. Coffee-lingerers should be publicly shamed, not indulged. Also, the state of the union is depressing and it is best not to spend too much time pondering it. Drink your coffee quickly and go lose yourself in work or hard drugs or something. Security risk factor: If the Ember app lets you remotely adjust and monitor your beverage’s temperature, then presumably it might also let someone else—an unscrupulous hacker, perhaps?—monitor and adjust its temperature. If you think hackers have better things to do than make your coffee so hot that it burns your mouth, then you clearly don’t know very much about hackers. Is the Ember Ceramic Mug more likely to be used to solve or commit a crime? This mug is more likely to be used to commit the crime of assaulting another person with a mug of coffee that has been warmed to precisely 145 degrees Fahrenheit. Should this thing be smart? This thing should be smart. The Ember is a fine example of an effective, nonintrusive smart device. It serves a specific and useful purpose, improves on existing technology without rendering said technology obsolete, and does not make the world a worse place simply by virtue of its own existence. 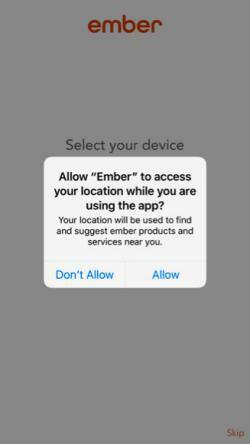 As with all smart objects, you are running certain security risks by using the Ember, but, you know, you also run a risk by drinking scalding hot coffee in the first place, or by leaving your house in the morning, or by not living inside a clean room. Most things are risky in one way or another—but most things will not also hold your coffee at the perfect drinking temperature. The Ember is the sort of item that once upon a time you might have found at Brookstone or The Sharper Image: a clever gadget that no one really needs but that everyone can nevertheless appreciate. Internet of Things Should This Thing Be Smart?